A 23-year old man underwent surgical resection of a fourth ventricular ependymoma [Figure 1]. Intraoperatively, the patient had multiple episodes of tachycardia and hypertension. Hypertension at emergence was treated with labetolol. After reversal of anesthesia, the patient was conscious with good spontaneous respiratory efforts. However, he continued to have unprovoked episodes of tachycardia, hypertension, extensor posturing, and hyperventilation lasting for a few minutes. The possibility of seizures, hypoglycemia, pheochromocytoma, and sepsis was ruled out with appropriate investigations. Magnetic resonance imaging of the brain showed a signal change in the brainstem with watershed infarction in bilateral frontal regions and vasospasm of intracranial arteries [Figure 2]. A final diagnosis of PSH resulting in cerebrovascular constriction syndrome was made. The treatment of autonomic dysfunction was attempted with morphine, beta-blockers, dexmedetomidine, and clonidine. Morphine and oral propranolol did not produce any significant benefit, while esmolol and dexmedetomidine led to severe hypotension. Three days after starting clonidine, although autonomic disturbances decreased, the patient's level of consciousness started fluctuating. He progressively worsened and expired 9 days after surgery. There is an abundance of data related to PSH occurring after acute brain injury, but the occurrence of PSH after tumor surgery has not been extensively reported., Goh et al., reported a 7-year old child with symptoms of PSH within 1 week of resection of a midbrain and thalamic tumor. He was initially treated with the presumptive diagnosis of seizures, but later only with clonidine, could these episodes be controlled. In their review, they found three patients with a tumor involving either the hypothalamus, thalamus, or hypothalamo-thalamic-third ventricle region, who developed the autonomic episodes. In tumors involving the hypothalamus, the pathophysiology is most likely an activation or a disinhibition of the central sympathetic regions, such as the paraventricular hypothalamic nuclei, lateral periaqueductal grey matter, or rostral ventrolateral medulla. In another recent case report, PSH was reported 2–3 weeks after surgery in two patients, one with a petroclival chondrosarcoma and another with a jugular foramen schwannoma. In both the cases, the tumors were firmly adherent to the brainstem. Both the cases were treated with an opioid patch. Our case was unique as the episodes developed during surgery and continued in the postoperative period. Moreover, the sympathetic hyperactivity was so severe that it caused cerebrovascular constriction syndrome leading to an unfavorable outcome. Treatment of PSH should target symptom abortion, prevention of episodes, and treatment of the refractory disease. Symptom-abortive treatments are indicated to control discrete episodes, using drugs such as morphine and short-acting benzodiazepines. Other medications used for the prevention of PSH and for addressing its refractory component are long-acting benzodiazepines, nonselective beta-blockers, alpha-2 agonists such as clonidine, opioids, and gamma-aminobutyric acid (GABA) agonists. The mechanisms by which these drugs improve symptoms of PSH are not clear. However, using a combination of drugs from different classes seems to be the most effective approach in managing symptoms of PSH. There is wide variability in clinical practice with regard to medication choices, dosing, and duration of treatment. Future research needs to be conducted to appropriately apply medical management. Mathew MJ, Deepika A, Shukla D, Devi BI, Ramesh VJ. Paroxysmal sympathetic hyperactivity in severe traumatic brain injury. Acta Neurochir (Wien) 2016;158:2047-52. Baguley IJ. The excitatory: inhibitory ratio model (EIR model): An integrative explanation of acute autonomic overactivity syndromes. Med Hypotheses 2008;70:26-35. Goh KY, Conway EJ, DaRosso RC, Muszynski CA, Epstein FJ. 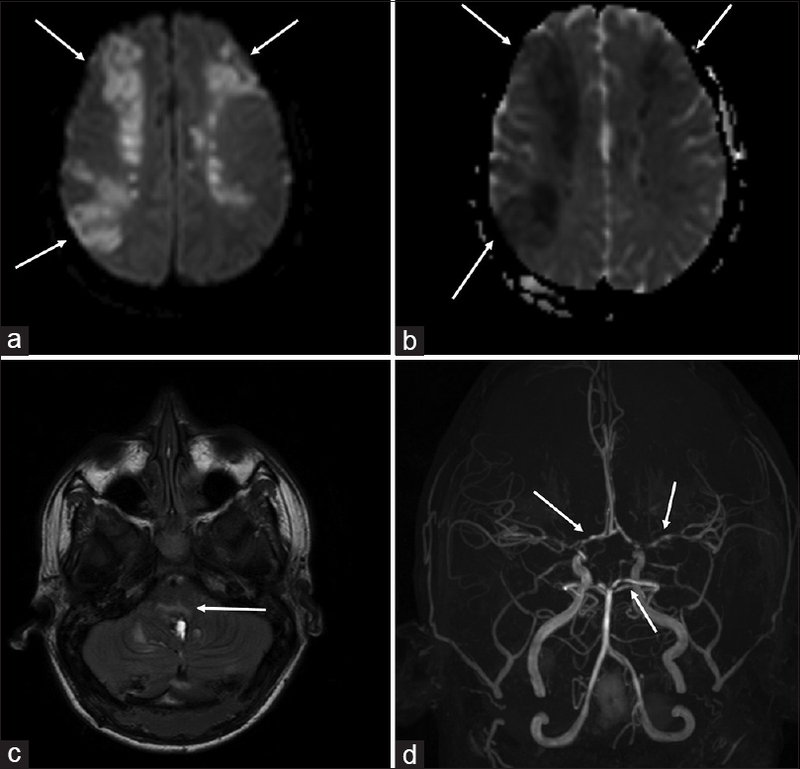 Sympathetic storms in a child with a midbrain glioma: A variant of diencephalic seizures. Pediatr Neurol 1999;21:742-4. Lee S, Jun GW, Jeon SB, Kim CJ, Jim JH. Paroxysmal sympathetic hyperactivity in brainstem-compressing huge benign tumors: Clinical experiences and literature review. Springerplus; 2016; 5: 340. doi: 10.1186/s40064-016-1898-x. Samuel S, Allison TA, Lee K, Choi HA. Pharmacologic management of paroxysmal sympathetic hyperactivity after brain injury. J Neurosci Nurs 2016;48:82-9.